If you’ve been quilting for a while you have probably started to get a large enough collection that all of your quilts can not be displayed at the same time. If some of your quilts are being folded and stored, watch this quilting tip to learn how to fold a quilt in a way that prevents damage- Kelly Hanson shows you how. The first step in learning how to fold a quilt is knowing what the bias of fabric is. The bias is the cross grain of fabric and is where it has the most stretch. 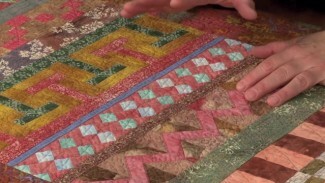 Typically quilt blocks are not cut or constructed on the bias, depending on the design, as doing so can cause blocks to distort when they are being stitched together. Because of this, when looking at a completed quilt the cross grain of the majority of the fabrics used to make it should run from corner to corner across the quilt. Once you know what the bias of fabric is, Kelly shows you how to fold a quilt. She makes all of her folds along the bias of the quilt, bringing in each corner to the center. It doesn’t matter if your quilt is a perfect square or not, the same technique can still be used. From there she can fold the quilt in half again to make it a little smaller and easier to store. Do not try to fold the quilt too many times, as the more folds you add the more chance there is for damage or creasing. 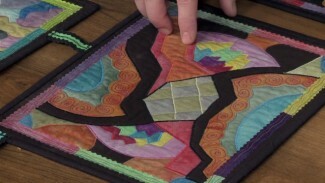 Another great quilting tip Kelly shares is how to store the quilt once it is folded. She recommends either making a pillowcase or using an old spare one to store the quilt. This will help protect it from exposure to dust, light and anything else that could harm it. This is brilliant! 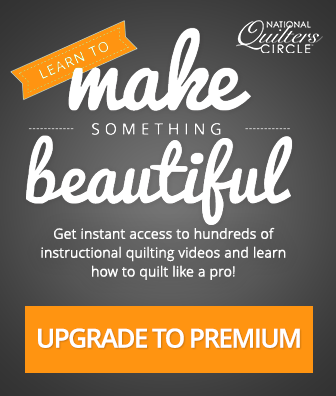 I will definitely be using this method for my quilts, and for my customer quilts in the future! In fact, I’m going to go refold a customer quilt right now, as she will be here to pick it up any minute! 😀 Thank you so much! 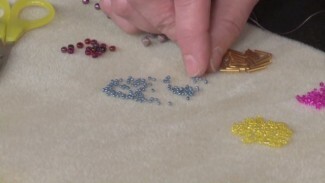 Peg Spradlin adds some elegance and beauty to your quilt top by teaching you how to add freeing feathers. 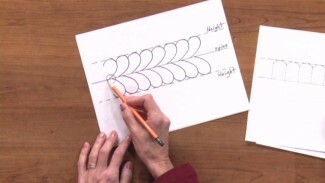 Learn how to draft a traditional feather starting with the height and spine. As you become more comfortable with this you will be able to make feathered cables and feathered wreaths.